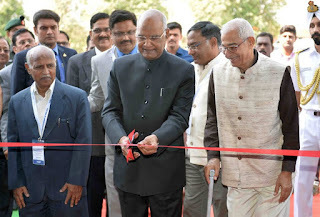 The Festival of Innovation & Entrepreneurship (FINE) was inaugurated by President Ram Nath Kovind at Grambharti near Gandhinagar in Gujarat. On the occasion, the President conferred 10th Biennial National Grassroots Innovation Awards. The Festival of Innovation & Entrepreneurship is organised by the President's office in association with National Innovation Foundation-India and Department of Science & Technology. Q. The Festival of Innovation & Entrepreneurship (FINE) was inaugurated by whom at Grambharti near Gandhinagar in Gujarat?